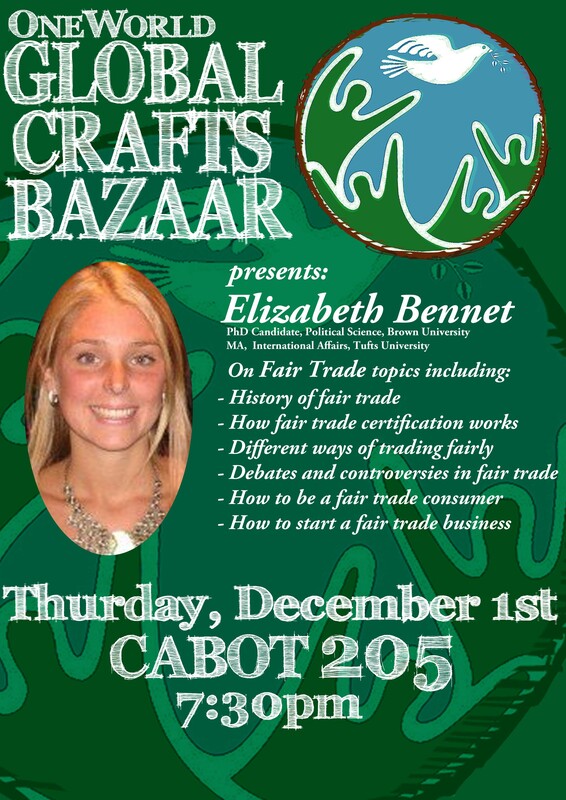 Elizabeth Bennet: What is Fair Trade Anyway? Where did the idea of “fair trade” come from? Who decides what is fair? What do all those labels and certifications mean, anyway? How do you know that your purchase actually is “fair”? Elizabeth Bennett, PhD candidate at Brown University and Fletcher alum (MALD ’08) will answer these questions and more in her lecture at 7:30 on December 1st in Cabot 205. The lecture and proceeding question and answer session will include a history of fair trade, a comprehensive explanation of how fair trade certification works, a discussion of different ways of trading fairly, a summary of current debate and controversies in fair trade, and guidance on how to be a fair trade and socially responsible consumer and how to start a fair trade business. For students interested in simply learning more about what the commonly-used term ‘fair trade’ actually means, or who would like to get involved in the fair trade movement, this lecture will be both interesting and instructive!